TIGER TOURISM INFLUENCING THE WILDLIFE DESTINATIONS IN INDIA !! Pench national park is the located in central India and is the place where writer Rudyard Kipling got the inspiration to write the world famous “Jungle Book”. Pench tiger reserve in divided in different zones with its some part in Maharashtra state and other in Madhya Pradesh. In either case, it’s best to travel to Pench via Nagpur city which is very well connected to other cities by network of flights and trains. Pench national park makes a perfect destination for tiger safari tours in india, especially because of the ever increasing population of tigers in this forest. One would have a fair chance of sighting a female tigress with its sub-adult cubs at Pench tiger reserve during summers when the water dries up and tigers wander out in daylight also in search of water and food. No wonder one has to do the online safari booking very early, if he doesn’t not wish to miss lifetime sighting of a tiger family !! Tadoba national park, located near Nagpur city in Maharashtra is currently at the heart of every wildlife lover for the tiger safari tours in india. Tadoba tiger safari offers magnificent sighting of wildlife especially tigers from a very close distance. Having a very small forest in terms of area and having comparatively more tiger density, the chances of spotting a tiger in Tadoba Tiger Reserve are always high. The forest is rich in bamboo habitation and has good accommodation facility at Tadoba for tourists. Newly in spotlight, commonly called as UKWLS is a wildlife sanctuary of area 189 sq.km.Umred Karhandla Wildlife Sanctuary, about 58 km from Nagpur, spread over Pauni,Umred, Kuhi and BhivapurTaluka. The wildlife Sanctuary was established in 2013. A huge male tiger who once ruled the forests of Nagzira Wildlife Sanctuary migrated 130 kms to Umred. This huge male is Jai. Chandi is another famous female found here who is Jai’s mate and is mother of 4 sub adult tigers. The list of Fauna keeps on increasing every year. The tiger population is booming in the sanctuary due to good prey base and suitable habitat. Other than tigers, one can spot leopards, jungle cats, civet cats, sambardeers, spotted deers, jackals, wild boards, wild dogs, nilgai etc. 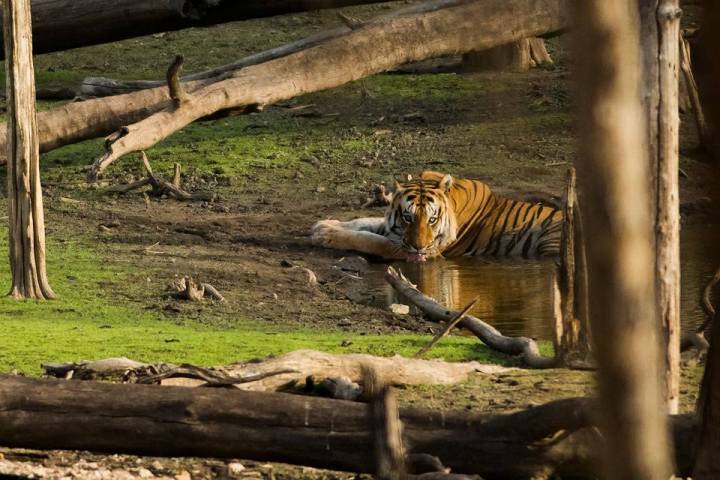 Ranthambore national park, once famous for tiger conservation efforts by Mr. Fattehsingh Rathod is located in Rajasthan. Sawai Madhopur is nearest rail station, Udaipur is nearest airport and various resorts and hotels at Ranthambore Tiger Reserve are professional enough to cater tourists. Wildlife safari booking is available online or at the forest gate and one gets the option for canter safari as well as open gypsy safari. Going for safari in some specific zones for better chances of tiger sightings is necessary hence it’s advisable to book through an agent who can help you book your wildlife safari tours in Ranthambore, India. Corbett national park in Uttarakhand district is one of the oldest and largest tiger reserves in India which is well divided in Tourism, Buffer and Core zones. The terai forest of Corbett tiger reserve are reach in flora and fauna. Tiger population at Corbett national park is very good however the chance of spotting one over such a huge landscape is a tough task. If your gypsy driver and guide are knowledgeable enough, you might get lucky to sight the striped beast with orange-yellow furry coat. One important thing about Corbett forest is, of all the wildlife safari destinations and national parks in India, Corbett national park offers the most scenic landscapes and river-scapes. Kanha national park is situated near Jabalpur city in Madhya Pradesh (MP) state of India. Kanha is a thick forest of sal trees and also shelters many grassland meadows which in turns make Kanha tiger reserve a great location to spot the royal Bengal tigers. Out of all the tiger safari tours in india, Kanha wildlife safari tour is always in high demand because of good sighting possibilities of tigers, leopards, wild dogs, sloth bears and Barasingha antelopes. One can travel by train or flight till Jabalpur and further road transfers can be done in pre-booked cars. Bandhavgarh national park has a connected forest corridor with Kanha tiger reserve and the forest flora and fauna is also very similar to that of Kanha. However tourists flow is always high for Bandhavgarh tiger safari tours than that of Kanha because of high ration of tiger sighting and the famous Bandhavgarh fort located right in the heart of forest. Online safari booking for Bandhavgarh tiger reserve opens 120 days before and one needs to book the permits and gypsy vehicles well in advance. Along with mesmerising fortest of Bandhavgarh, one can also explore the gigantic dhuandhar waterfall and scenic bhedaghat boating during this tour. Sundarban national park (also known as Sunderban forest ) is popularly known as the “Amazon of east”. Located close to Kolkata city in West Bengal state of India, Sundarban delta is actually a vast area of mangrove forest generated in saline water and it is situated on the international borders of India and Bangladesh. The royal Bengal tigers of Sundarban tiger reserve as are well known for their surviving skills in salt water ecosystem and their inclination towards man-eating behaviour. The tigers here have adapted themselves well with the swamp and salt in the area and one have to opt for hull day or half day boat safari in order to explore forest and tigers, making it the most unique of Tiger safari tours in India. Bandipur tiger reserve is one of the best managed project tiger reserve in India. This 874 Sq. Km tiger reserve is located in Karnataka state of India and is a part of Nilgiri Biosphere Reserve. The land hosts various ecosystems and biomes which in tern shelter more than 75 tigers, 85 leopards, many herds of wild elephants and hundreds of colorful birds. For nature lovers, Bandipur offers a great feel of rich western ghat forests and biodiversity including a few endangered species, which makes a critical wildlife habitat which needs to be conserved efficiently. Wildlife tourism at Bandipur in a way lends a supporting hand for conservation and also creates great level of awareness among wildlife lovers and photographers. The promising Bandipur has a lot to explore within those dense green forests…by your eyes as well as by camera !! Nagzira wildlife sanctuary is a part of Navegaon-Nagzira tiger reserve located near Nagpur city of Maharashtra. Though it has not yet qualified for the National park status, Nagzira is not less than national parks like Tadoba and Pench. Moreover the forest type and biodiversity at Nagzira wildlife sanctuary is very similar to that of Pench and Tadoba. No wonder that Nagzira shelters a healthy population of Tigers and leopards. Along with these big cats Nagzira is famous for sightings of major raptor birds like grey headed fish eagle, Crested hawk eagles and white eyed buzzards. The famous tigers of Nagzira includes the angry male Dendu, bold female named ‘A’ mark or Mai and the handsome male tiger Jai. Tiger Jai migrated from Nagzira and has now established his territory in Umred Karhandla wildlife sanctuary. The best season to visit Nagzira is during summers.